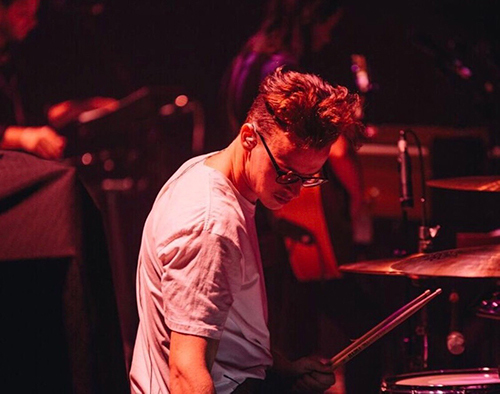 As the drummer for Asta, at a young of 21, Liam Drinan is already starting to carve his place in the music industry as one of the most exciting and talented musicians in the country. Liam's drumming career began at the age of 11 whilst living in Western Sydney, New South Wales. After studying and learning his craft with lessons from Kosta Theodosis for many years, Liam studied at the Australia Institute of Music where he furthered his skills. During his time at AIM, Liam had the privilege of being taught by Andrew Gander. After being based, playing shows around Sydney for many years. Liam landed his first touring gig with Asta, going on tour with her supporting Allday on a sold out national tour as well as Asta's headline Dynamite Tour.